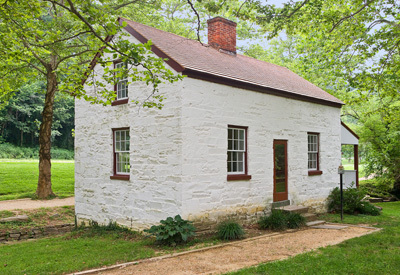 Lockhouse 28 is a restored structure that is available for rent from the C&O Canal Trust. Completed in 1837, the lockhouse stands as a reminder of the fierce competition between the Chesapeake & Ohio Canal and the Baltimore & Ohio Railroad in the race to reach the Ohio River Valley. The competition was the most intense at Point of Rocks, where the rocky outcropping leaves a very narrow space for a canal or railroad--but not both. The canal won the battle, but the railroad won the race to Cumberland.